The 2007 Baileys Horse Feeds / British Breeding Futurity Scheme had a section for ponies and small horses (not likely to exceed 158cm). This is the second time the section has been available and the results from the all venues are consolidated below. SPSS Registered ponies are shown in bold type. Top Yearling Pony - Rochand Bright Spark (SPSS) - Score 8.23 - By Lumes (DRP/SPSS) ex Christerene Arabella (AHS PB) by Clavering Baronet - Owner & breeder: Dani Phalp. 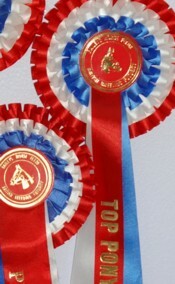 In 2006, there were 23 ponies and small horses forward - click here for the consolidated results from the 2006 qualifiers. At the 2006 Final, the SPSS registered foal, Trevaulter Brenmingh by Gorsfraith Brenin, was Extra Super Premium Foal - a fantastic result for Trevaulter Stud as this was against all the horse foals as well as the pony ones. (SPSS) Chestnut Colt, born 2007. Sire: Caesar 171 (DRP/SPSS); Dam: DHI Tiger Lily(DRP/SPSS) by Donnerwetter (DRP). Owner & breeder: Mrs B J Brown. (WPCS) Chestnut Colt, 18/06/2007. Sire: Cwmcae Comet Bach (WPCS) Dam: Royalbrook Supreme (IHR) by Diamond Rock (IHR) Owner breeder and handler: Claire Howarth . (SPSS) Bay Colt, born 2006. Sire: Lumes (DRP/SPSS) Dam: Christerene Arabella (AHS PB) by Clavering Baronet Owner & breeder: Dani Phalp. (NPS) Dk Bay Colt, born 06/04/2006. Sire: Littledale Bright Star (SPSS); Dam: Lillibet (NPS) by Liboi (TB). Owner & Breeder: Mrs AG Loriston-Clarke. (WPCS/SPSS) Chestnut Colt, born 23/05/2007. Sire: Diachristu Dynamite (WPCS). Dam: Poplar Lady (TB) by Doctor Wall (TB). Owner & breeder: Michelle Godwin. (NPS) Dk Brown Filly, born 16/04/2007. Sire: Littledale Bright Star (SPSS); Dam: Lillibet (NPS) by Liboi (TB). Owner & breeder: Mrs AG Loriston-Clarke. (TBF) Bay Filly, born 24/04/2005. Sire: Lucerne X-Factor (NF) Dam: Fleetwater Caprice (TBF) by Fleetwater Achterman Owner, and handler: Dani Phalp, breeder: Louise King.